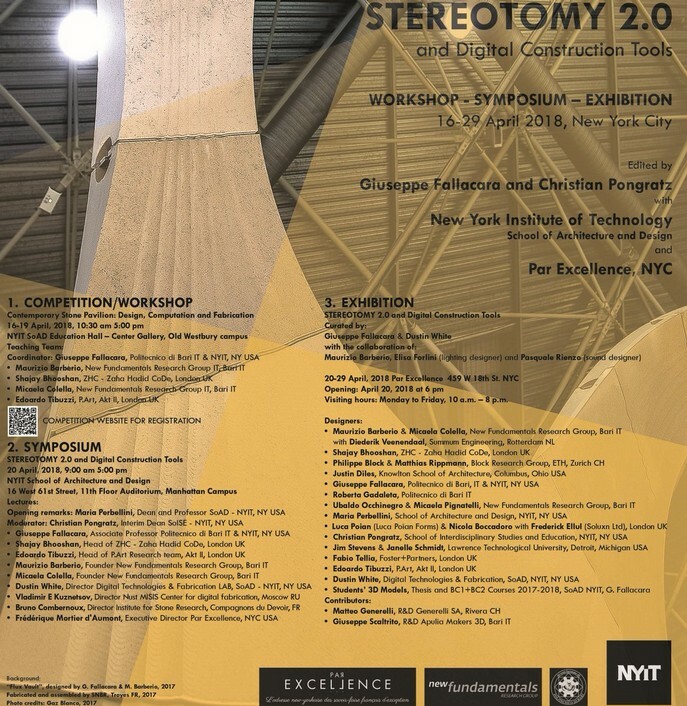 “Stereotomy 2.0 and Digital Construction Tools” is the title of the event that was held in New York from April 16th to April 29th, 2018. 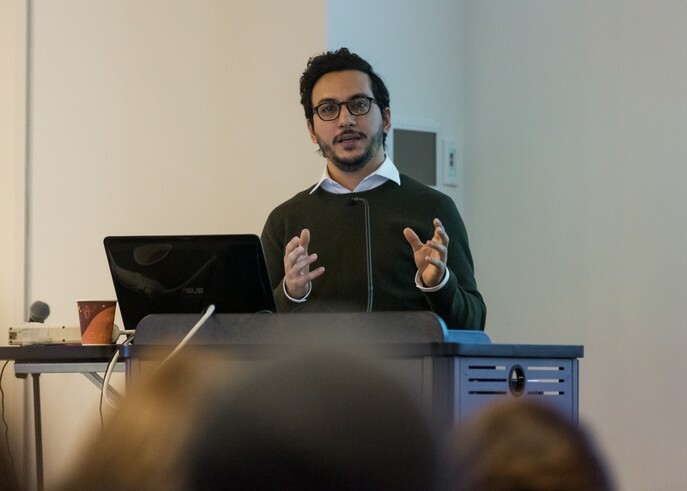 The aim of the event was to disseminate theoretical and practical culture related to stereotomic architecture, from its origins in the sixteenth century to the latest design applications. 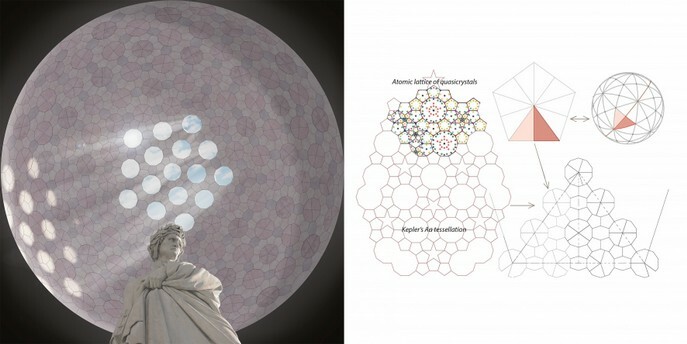 The event, conceived by Prof. Giuseppe Fallacara, was supported and promoted by Prof. Maria Perbellini, Dean of School of Architecture and Design (SoAD) of New York Institute of Technology (NYIT) and curated with Prof. Christian Pongratz, Interim Dean of School of Interdisciplinary Studies and Education of NYIT, in collaboration with the New York Institute of Technology, New Fundamentals Research Group, Zaha Hadid CoDe and P.art from AKT II. The event included several activities in several locations of the city: a workshop, a symposium and an exhibition. 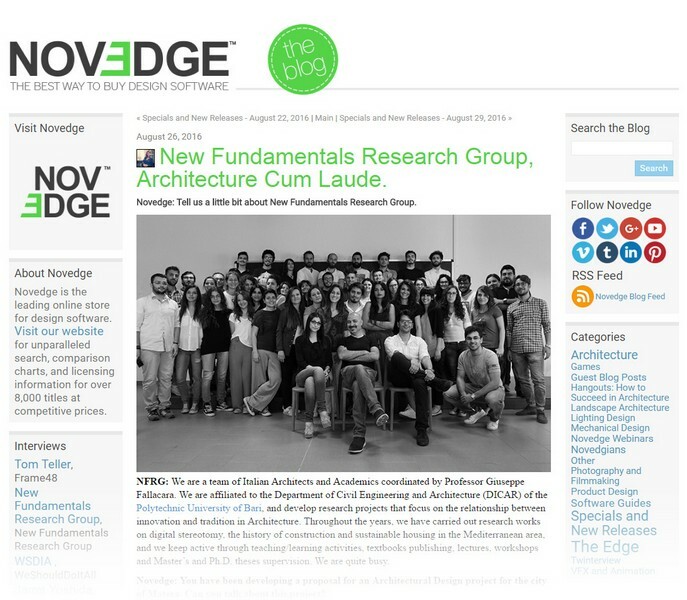 NYIT supported the whole event as part of its global strategy of research on technological advancements in the field of robotic fabrication techniques applied to architectural design and construction. 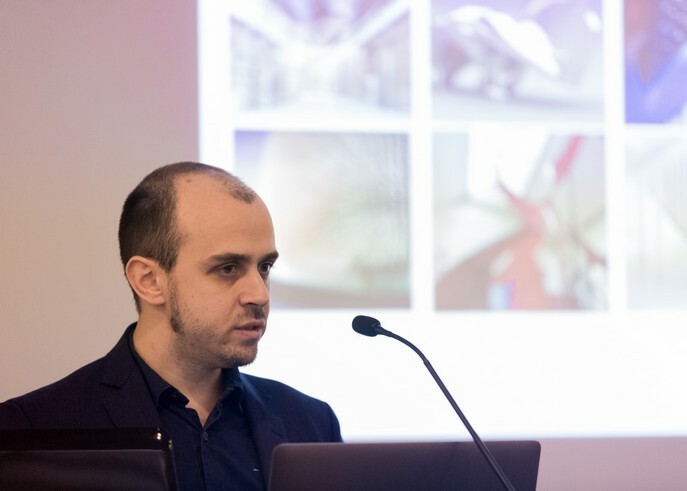 The workshop was held by tutors coming from Zaha Hadid CoDe (Shajay Bhooshan and Vishu Bhooshan), AKT II p.art (Edoardo Tibuzzi and Lorenzo Greco) and New Fundamentals Research Group (Maurizio Barberio and Micaela Colella). 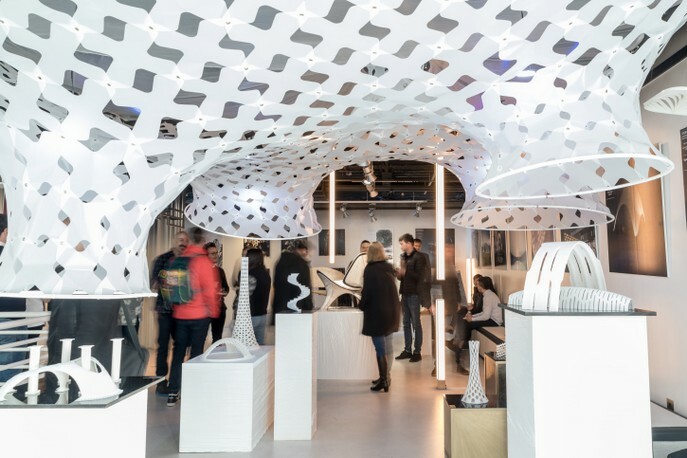 The activities carried out concerned the digital re-design process of the design ideas developed by the students for the competition, from the definition of the structural form to the static analysis and parametric modeling of every component of the pavilion's structure. · Vray for Rhino: Results visualizations. 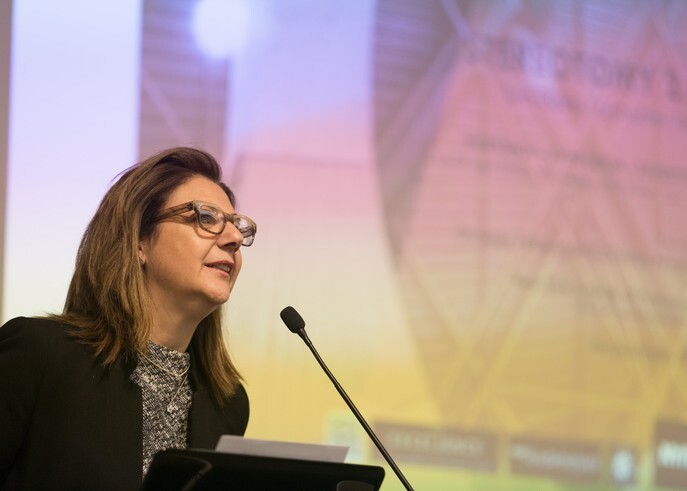 The symposium "Stereotomy 2.0 and Digital Construction Tools", held on April, the 20th at the 11th Floor Auditorium of the NYIT Manhattan Campus, was introduced with the opening remarks of the Dean of the NYIT School of Architecture and Design's, Maria R. Perbellini. 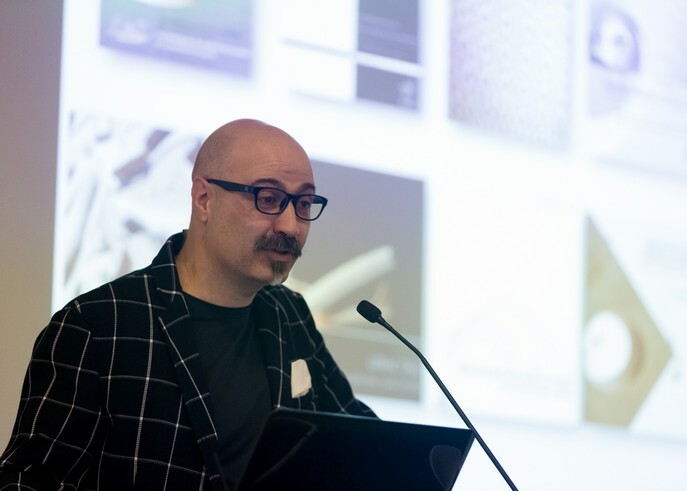 Every contribution was preceded by a brief introduction by the moderator Christian Pongratz. 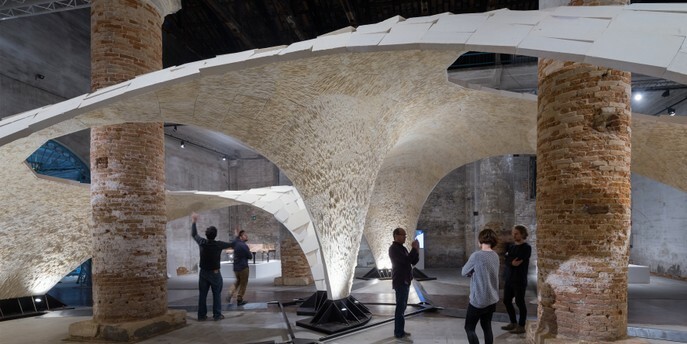 Contributors included Giuseppe Fallacara, Shajay Bhooshan (Associate at Zaha Hadid Architects in London and Head of Zaha Hadid CoDe), Edoardo Tibuzzi (Associate Director at AKT II in London and Head of p.art), Maurizio Barberio and Micaela Colella (PhD, Politecnico di Bari), Omid Oliyan Torghabehi (Ph.D. candidate at Taubman College of Architecture, University of Michigan), Alex Reggiani (geologist from the Russian company Renca), Vladimir E. Kuznetsov (Lab Head of the Centre for digital fabrication at National University of Science and Technology MISIS in Moscow), Bruno Combernoux (Head of the Institut Supérieur de Recherche et Formation aux Métiers de la Pierre), Dustin White (Director of the Fab Lab of the NYIT School of Architecture and Design). 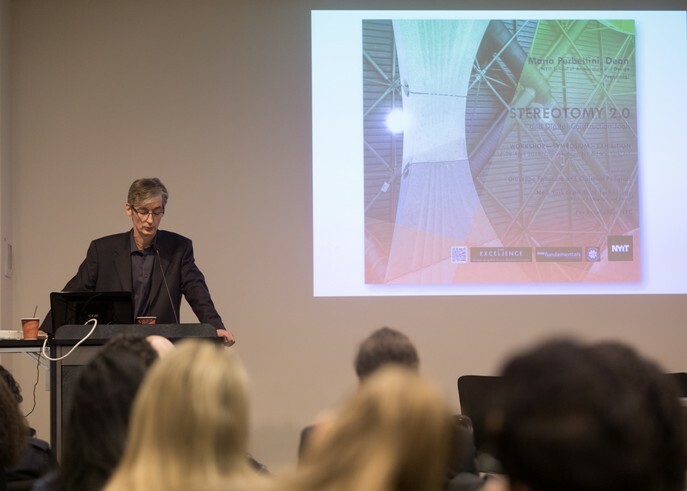 The symposium was concluded by a podium group discussion moderated by Christian Pongratz, and a short presentation by Frederique Mortier d'Aumont of the Par Excellence gallery, the location of the Stereotomy 2.0 Exhibition. The exhibition was held in New York at Par Excellence NYC from April 20th to April 29th, 2018. 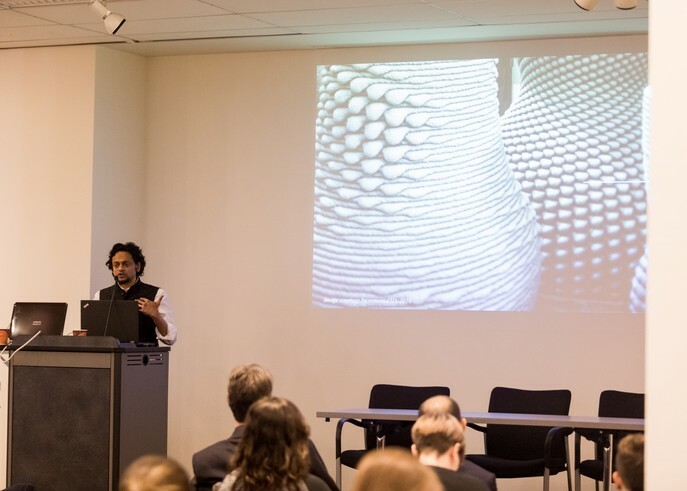 On April the 20th, the curators, Giuseppe Fallacara and Dustin White, asked to talented designers and academics to imagine new applications of the stereotomic principles within the various forms of contemporary architecture (Fig. 3). 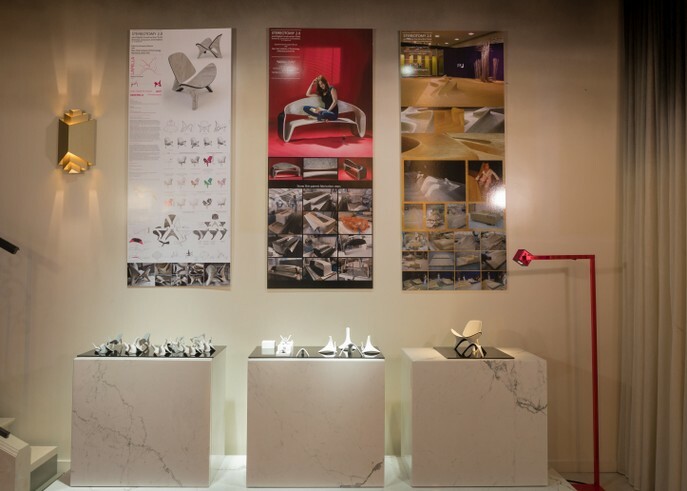 The projects presented during the exhibition displayed practical and feasible architectural applications. The theme of Stereotomy 2.0 was interpreted in numerous forms by the designers. 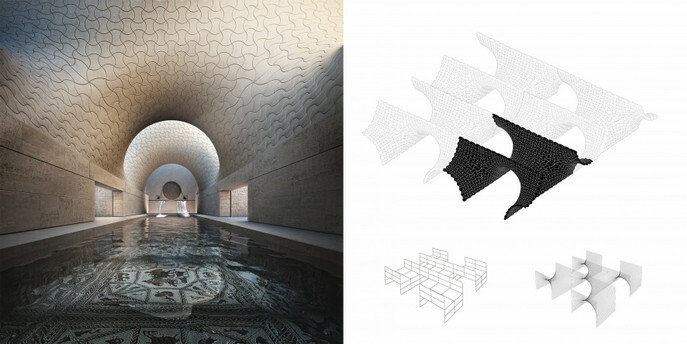 Most of the projects were new interpretations of vaulted or domed spaces, while other projects showed new applications of themes such as pavilions, towers, porticos, and walls. 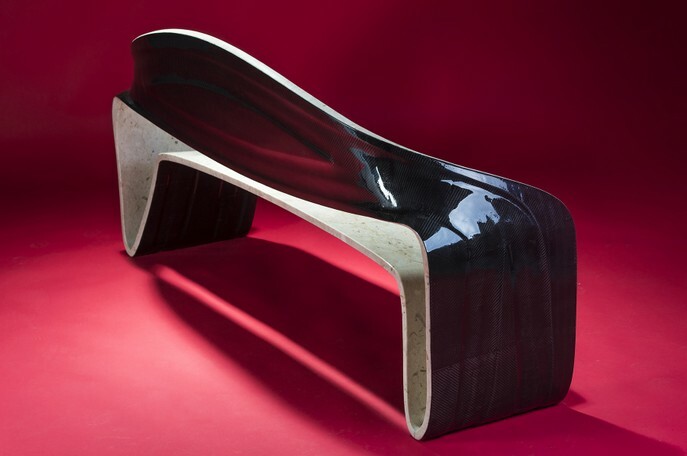 Concerning materials, most of the designers selected the stone, foreseeing how to take advantage of the potentialities of the latest CNC and robotic manufacturing techniques. 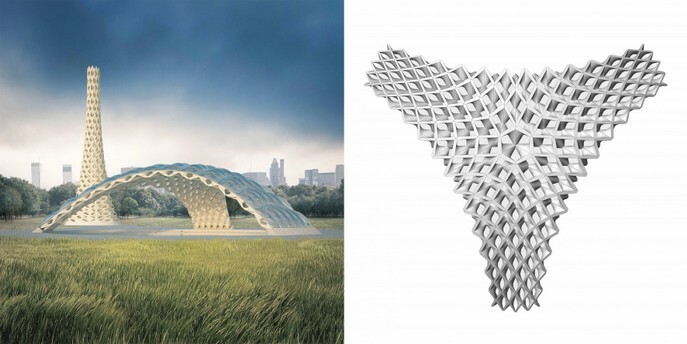 Others designers conceived the use of additive manufacturing procedures to obtain complex blocks in innovative ways. Poster "Capriccio di Sterotomia" by Mua Studio (Ubaldo Occhinegro and Micaela Pignatelli). 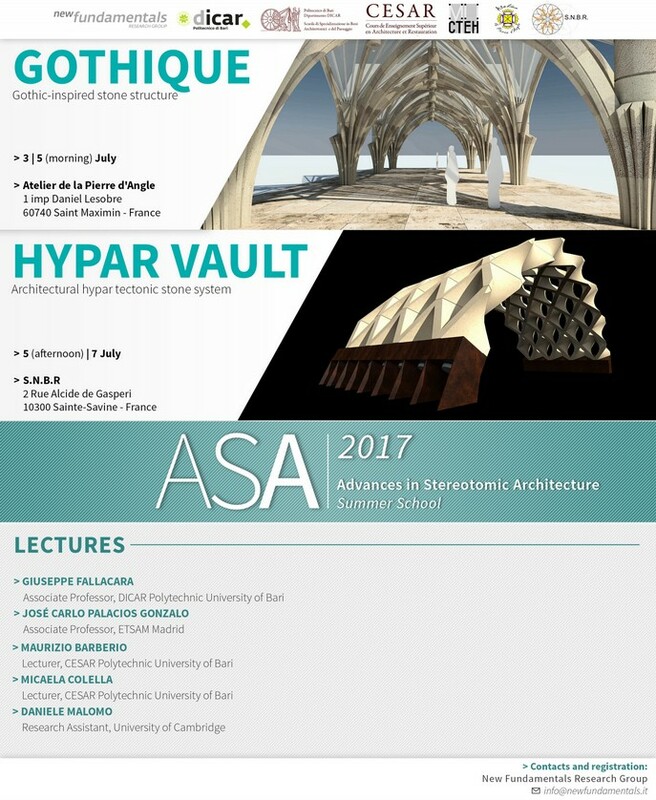 Hypar Vault II, designed by Giuseppe Fallacara and Maurizio Barberio. 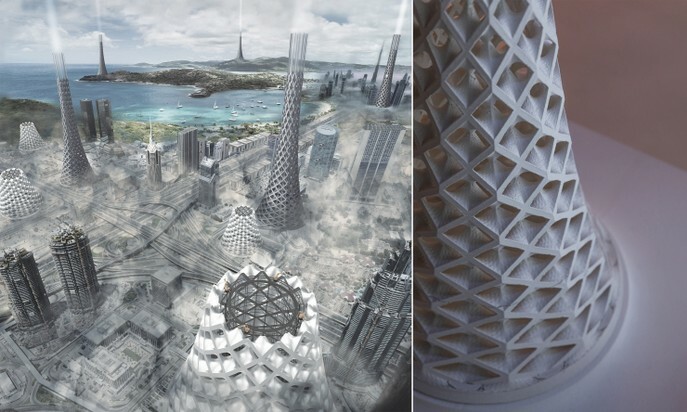 Anthill Tower, designed by Giuseppe Fallacara. Photo: Gotham Fotografia. 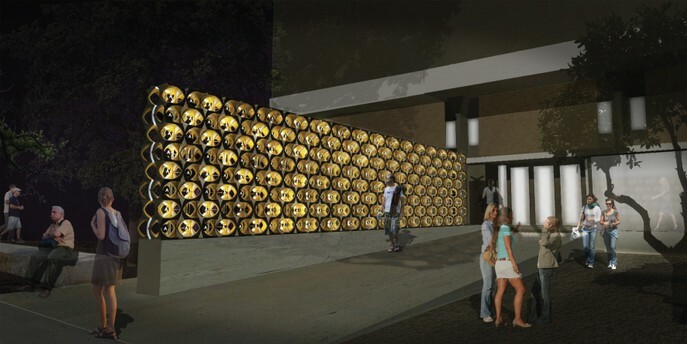 Armadillo Vault, designed by Block Research Group, ODB Engineering and Escobedo Group. 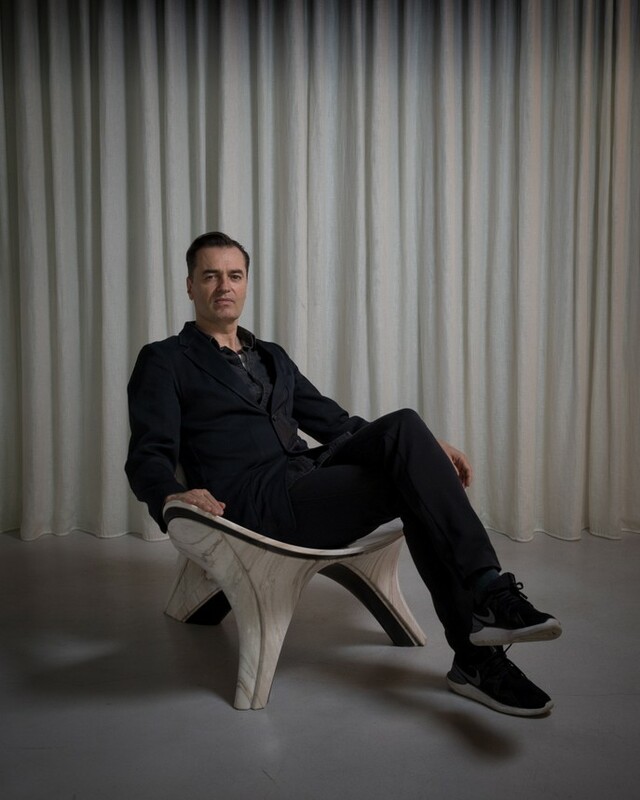 Photo: Iwan Baan. 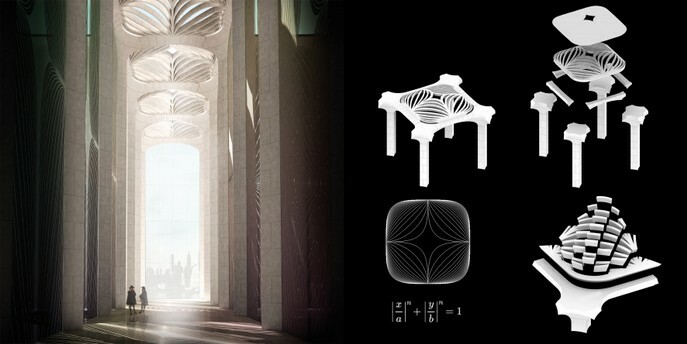 Additive Stereotomy, designed by Maurizio Barberio and Micaela Colella with Diederik Veenendaal. Plastic Stereotomy, designed by Justin Diles. 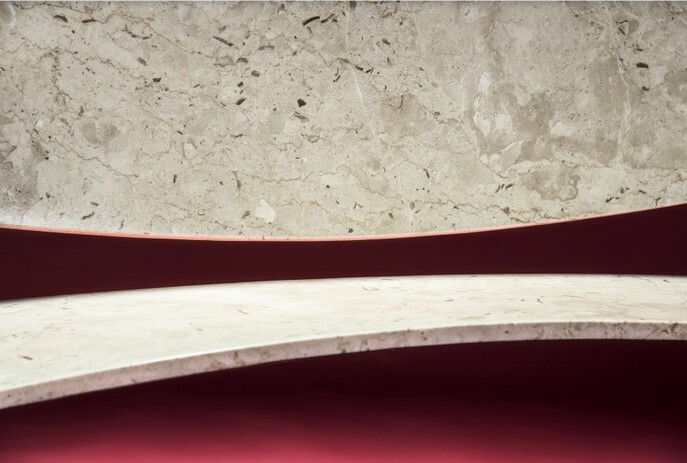 Stereotomic Scherk Vault, designed by Luca Poian and Nicola Boccadoro with Frederik Ellul. 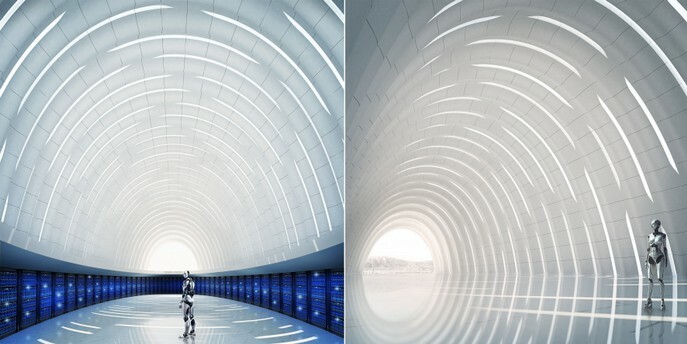 Superellipse Rib Vault, designed by Fabio Tellia. PentaDome, designed by Roberta Gadaleta. 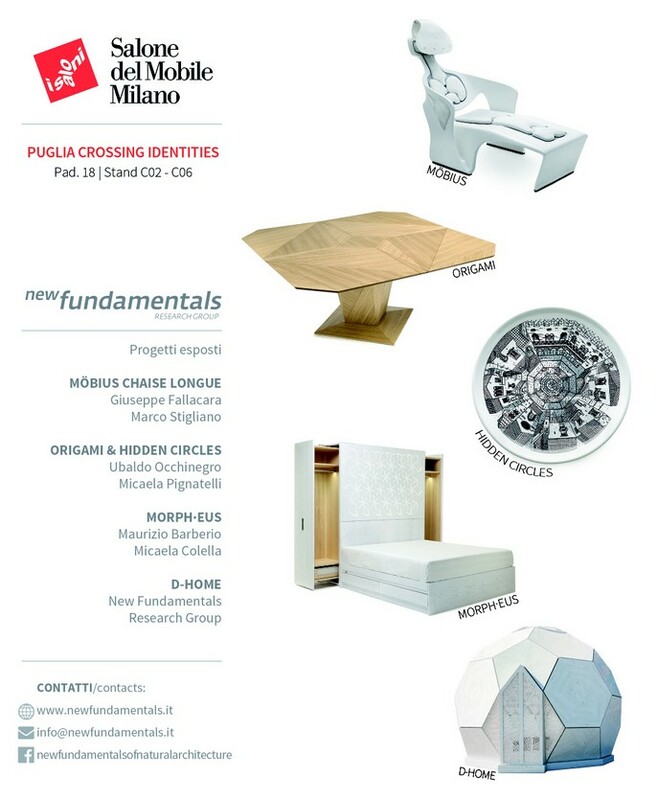 Magic Letters, designed by Christian Pongratz e Maria Perbellini. Trait #4, designed by Jim Stevens and Janelle Schmidt. 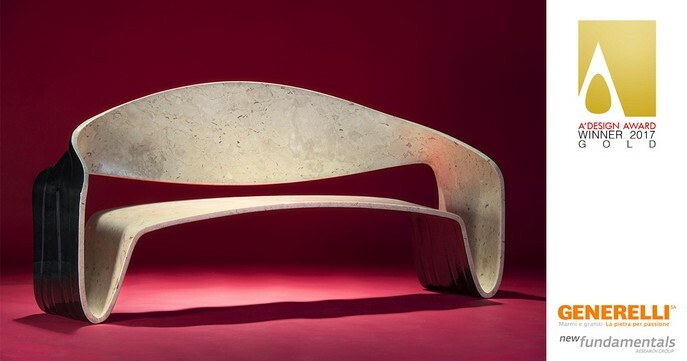 The exhibition included also three prototypes of stone furniture, one made of massive stone and two made of thin fibre-reinforced stone. 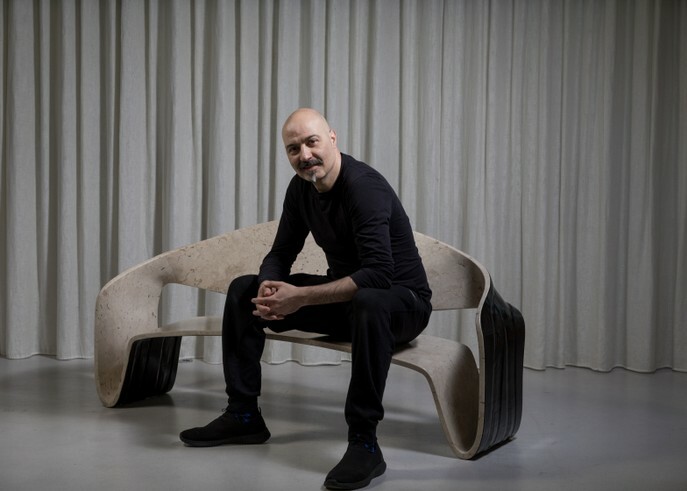 This relatively new axis of research applies stereotomic techniques to the world of furniture design, thanks to the latest generation of CNC machines and 3D modeling tools, that allow the creation of complex shapes informed by ergonomic data, optimized by structural analysis software developed in a full parametric environment. 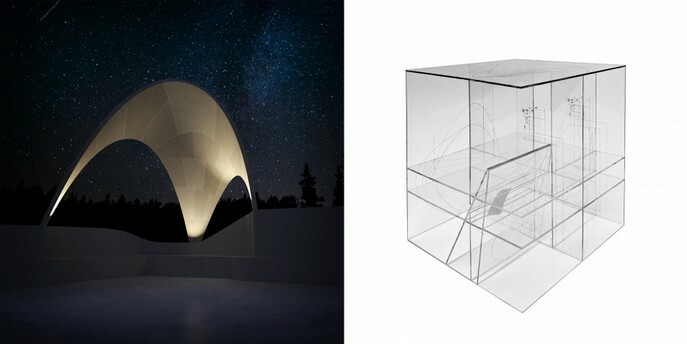 Among the three prototypes, "Lapella" by Zaha Hadid Architects, has been designed specifically for this exhibition, as the masterpiece of the whole event. 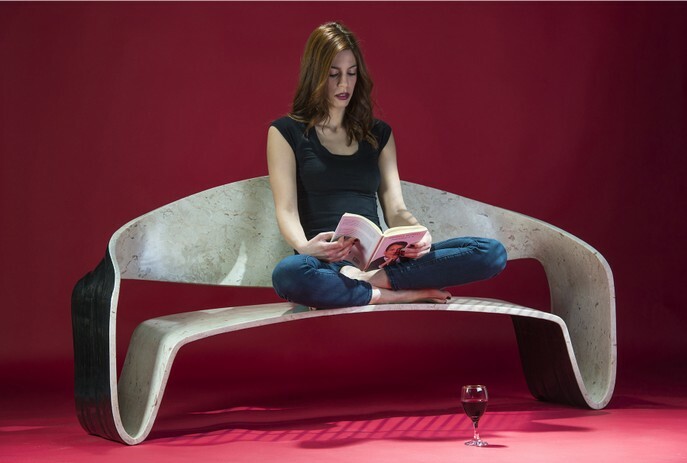 Lapella, designed by Patrik Schumacher with Zaha Hadid CoDe and AKT II, with New Fundamentals Research Group and Generelli SA. Photos: Giuseppe Fallacara. 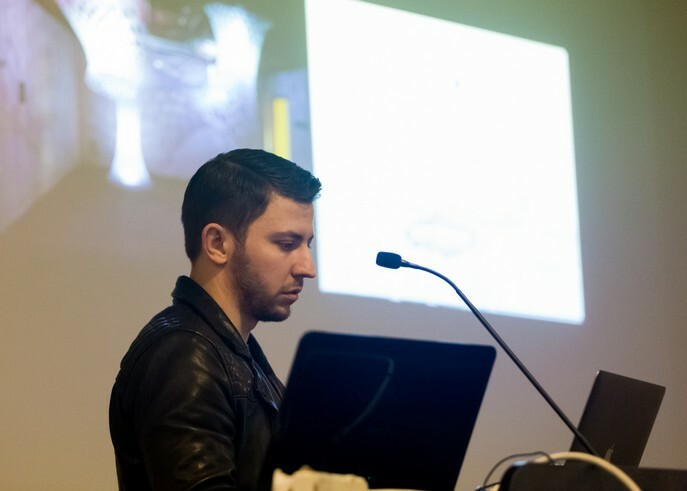 The event "Stereotomy 2.0 and Digital Construction Tools" proposed, to an international audience, several ideas for the renewal of stereotomy. 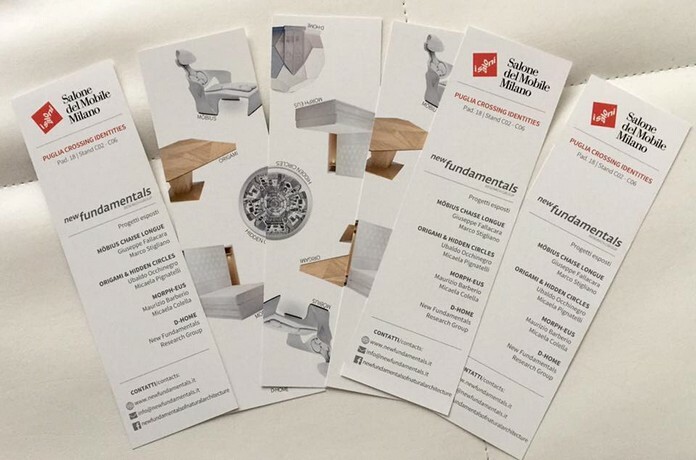 Conceptual ideas and built examples based on the "stereotomic design" principles have been fully explained throughout the symposium and during the exhibition thanks to models and posters. 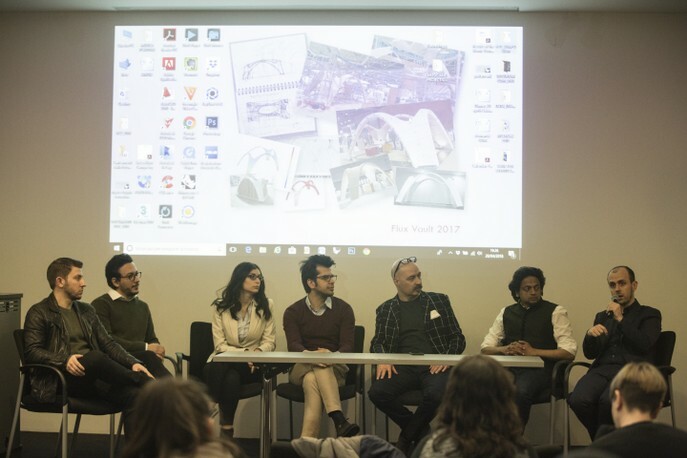 The ambition of the whole event was to disseminate the Stereotomy 2.0 fundamentals, in order to become central within the contemporary debate on avant-garde architecture. 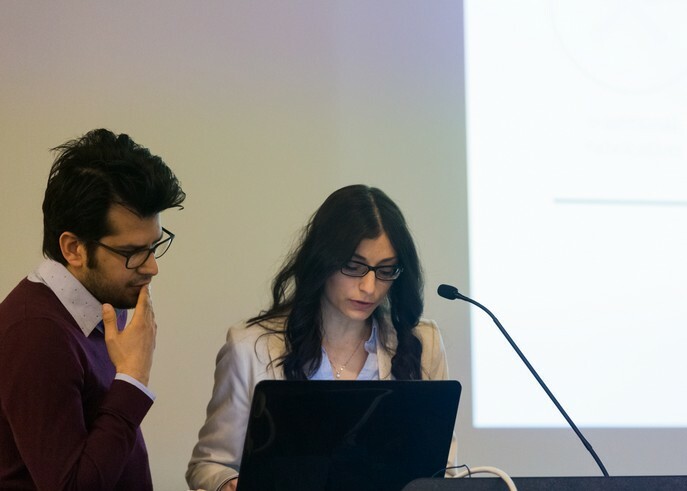 This text is an excerpt from Micaela Colella's conference report "Stereotomy 2.0 and Digital Construction Tools", Nexus Network Journal 20(3), pp 769–788. The catalogue fo the whole event (edited by Giuseppe Fallacara) is available here.